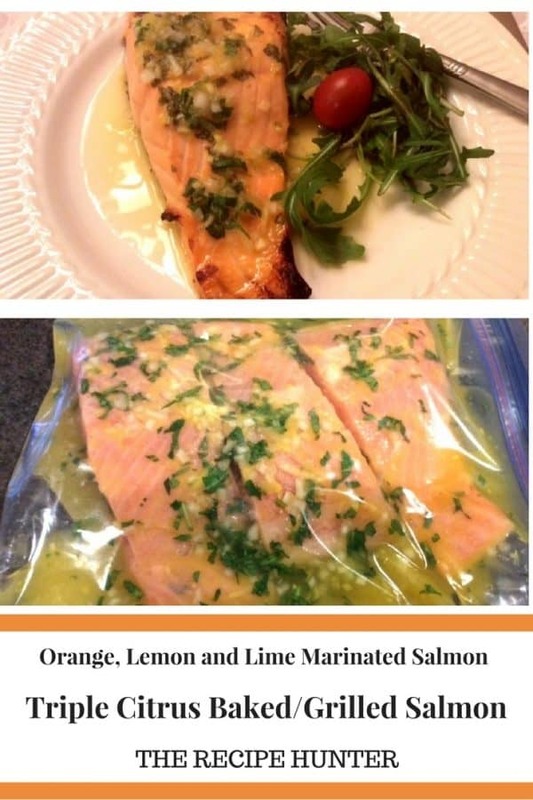 Delicious, Easy and Flavorful Orange, Lemon and Lime Marinated Baked, Grilled or BBQ Salmon! Mix together all the marinade ingredients and pour into a large Ziploc bag. Add the salmon fillets and marinate for ±45-60 minutes. Do not marinade it for more than an hour, as the citrus will start to cook the salmon. Remove salmon and ever so lightly pat dry with a paper towel, but do not remove the other ingredients from the salmon. Bake in the oven at 350F for 10-15 minutes, depending on how you like it cooked. Be careful not to overdo it as salmon can dry out very quickly if not careful. Another option would be to grill it over medium-high heat, turning it over and grill both sides, or you can even BBQ it if you prefer. Sprinkle with pepper as per your preference. Serve with extra citrus juice and a side salad of Arugula leaves and baby tomato. Oh wow. What an honour, thank you so much for thinking of me, this is so kind of you. So sorry about typos. 😢 I am on my way to bed and just heard my phone beeping and saw your note and wanted to respond immediately. Sorry again about that. Normally do not respond from phone as I know this pose more room for errors, for me at least. Cannot wait to try this! I love the addition of ginger here. I have two lemon trees that are currently exploding with citrus, and an orange tree as well…this sounds like a great way to make use of the citrus! Thanks my friend – it’s very simple but we love it. Coming from a butcher family, we do quite a bit a meat, but must admit that lately we have cut back a lot and still do eat it but not so much as many moons ago. I think most people are cutting down on meat now don’t you ? We do as it’s only the two of us and with the price of meat nowadays, but for that matter any food, we do very small portions and try not to have any leftovers! Gr8 Share. Salmon & orange, sounds delicious!! !